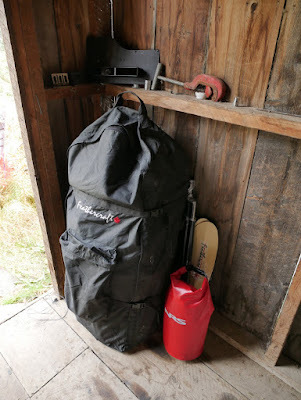 I am tidying up the kayak and gear which the Deacon family kindly will keep in their shed for next paddling from Grayling village to the Bering Sea. Because the kayak can be taken apart and be stuffed into a nylon sack, I can load it into an airplane. However it is highly probable that the kayak will get damaged by a rough handling at an airport. In fact, although that nylon sack is made from a thick nylon fabric, it got damaged and had a lot of hole when I carried the kayak from U.S. to Japan at last time. Therefore, it has much value that my kayak will be kept by them and I could avoid risks while carrying it back to Japan this time and carrying it to Alaska next time.